Belonging, Part One is a new site-work by Blue Lapis Light, highlighting the beauty of our earth and our relationship to one another. These performances will feature aerial dancers on the Seaholm architecture with aerialists swinging from the stacks, ground dancers, and digital media focused on the sustainability of our environment. “Blue Lapis Light has soared since the first performance we attended years ago. Sunday night was not just cohesive, consistent, and striking: there were moments of sheer grace when, impossibly, one could almost hear the doors of transcendence creek open. Moments when one wished to embrace humankind at the sight of dancers in suspense, gliding across beams of light in seas of music, as toddlers danced below. Moments when a hundred personal worlds melted away and a hundred souls shared the emotion of a singular vision. The performance was incredible. It was truly one of the most beautiful things I’ve seen… I wept from the beauty of it for most of the show. There is a presence, an energy that vibrates through all of life, a field of Light connecting us to stars, planets, this earth, animals, and to one another. The staging of this transcendent work will include performing on the Long Center’s terrace, ring and columns, as well as the making of two “celestial harps.” These “harps” will be created by connecting the columns with multi-level steel cables, allowing dancers to move across and ‘play’ notes as the mic’ed cables capture the sounds of their feet. These 20 x 30 foot “harps” will be located at both ends of the terrace. Save the date! BLL will stage a large-scale aerial performance on our property in South Austin this September in conjunction with the Grand Opening of our new Studio and our 10 year anniversary. This new work will feature multiple dancers on a 48 foot wide x 25 foot high scaffold with a custom designed wall and rope structure. Blue Lapis performed on the City Terrace of the Long Center. With the Austin skyline as the backdrop, dancers appeared upon the ring of a grand colonnade. A powerful soloist dances the story of finding unity within oneself and the world. A host of heavenly performers guide the one dancer to her place among the most high. 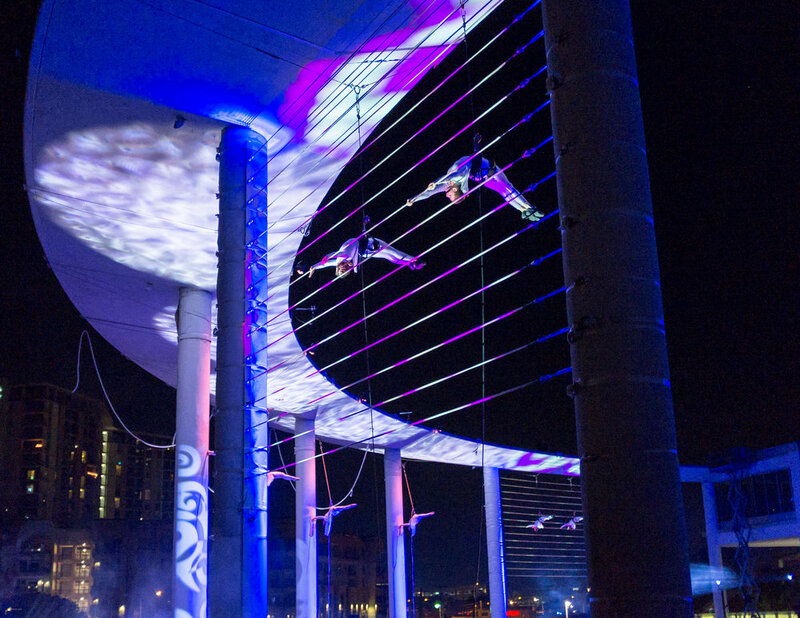 With ropes, harnesses, and aerial silks, dancers cover a wide expanse, dancing above, upon, and in between the columns of the City Terrace. For this site-specific dance the audience faced the J.J. Pickle building. 40ft aerial cloths hung in mid-air as 5 aerialists ascended above the plaza. The cloths blew in the night wind as dancers partnered in the air, holding each other above the concrete. A dancer descends from a zipline, walking through the towers of cloth into the building, later to dance down the building back to her zipline for her final journey to the other side of the plaza. Rappellers descend, jumping down the wall face as dancers float along to building face. Inspired by our dear friend Tina Marsh, Impermanence revered our eternal love amidst life’s ever-changing journey. The iconic Intel Shell had become known as an “eye-sore” and a “doomed structure”, a blemish on downtown Austin, firm as a reminder of things hoped for and never fulfilled. This structure, something like a five story parking garage, became the first of many large-scale public stages on which Blue Lapis performs. Requiem featured dancers floating 75ft from the ground, dancing in and out of concrete columns. Dancers performed on 50ft aerial cloths as they blew in the night wind. The piece reached many people, touching many viewers with its message of transcendence through transformation. An evening length site-specific dance presented in a large warehouse that is now Austin’s Domain shopping center. Where Nothing Falls II featured a cast of 20 performers who danced with rollerskates, skateboards, harnesses, nets, and bungees. It portrayed a struggling humanity, comforted by the angels who glide and fly with them through their journey. You’re invited to join us at the Immerse and Emerge weekend- The Salado Arts Experience, Friday April 24 at 9pm. BLL’s performance will be held on the grounds of the Inn On the Creek, in creek side grove with 100 year old trees, aerial silks and poles. Make a weekend of it and enjoy the charming Village of Salado’s full schedule of events, including live stone carving and culinary tastings! Commissioned for the museum’s aviation exhibit, Limitless portrayed the journey to infinity and beyond! Four dancers appeared atop the museum, beginning their great mission into the unknown. Their quest sends them floating along the museum, performing petit allegro along its curved façade. As the make their way down they float and flip more and more, finally making contact in mid air. When they finally connect, they are ready for their next mission, and their captain rockets back up the building to lead the way. Students perform original aerial silk performances, presenting 16 pieces to exploring a wide variety of themes and music ranging from Poison to Strauss. The show features a wide range of age and skill levels, presented with custom rigging, lighting and sound design. The Boyd Vance Theater inside the George Washington Carver Museum holds about 170 audience members. There is wheelchair accessibility and free parking at the museum and surrounding streets. We provide light refreshments for suggested donations. There is a 10min intermission and a slight pause between each piece as the curtains go down. This event is family-friendly, exciting, heart-warming and a joyful presentation of Blue Lapis Light's beautiful and hard-working students. Blue Lapis Light’s Student Showcase features aerial dance works created for and by students. Blue Lapis Light and our students will present Refuge at the Boyd Vance Theater in the Carver Museum Thursday, Friday, and Saturday, November 17.18. & 19. Doors at 7:30pm Show at 8:00pm. Over an 8 week period our students have contributed their strength, grace, and artistry in lending to the creation of Refuge. During this time students not only learn new skills and techniques of aerial dance, but they learn how to commit to performing and how to share their artistic voice. While watching this show you will more than likely experience the feelings of: excitement, awe, thrill, passion, bliss, hope, and so much more! This is a popular event and tickets often sell out. We suggest purchasing online in advance for a discounted price of $12/Regular Seat and $25/Prime Seat. Prime Seats are two rows in the middle of the Theater with the best view. No seat numbers are assigned- tickets are open by section. Tickets will be available at the door for $15/Regular Seat and $28/Prime Seat. Light refreshments will be served at intermission, with a suggested donation for drinks. Cash and Credit Cards are accepted. Blue Lapis Light’s Student Showcase features aerial dance works created for and by students, culminating in our fourth annual Student Showcase, Within and Beyond in the Boyd Vance Theater at the Carver Museum. Our students and staff continually collaborate, creating dances that reflect the mood and skills of on-going aerial classes at Blue Lapis Light. The student showcase gives voice to a variety of expression as up to 14 aerial dances are included in this show. Students learn about the preparation of performing and the commitment of sharing their artistic voices. We watching this show prepare to experience joy, excitement, nervousness, thrill, passion, bliss, hope, and so much more! Youth Taking Flight is a collaborative dance program for teens from local social service organizations. Blue Lapis Light and students from Austin Children’s Shelter meet twice a week during a semester to an create original dance performance with music, movement, and aerial dance. We are so excited to welcome special guests Ballet Afrique Youth Dance Ensemble who will be joining us for this performance. Ballet Afrique is a contemporary dance company that employs a synthesis of ballet, modern, and African traditional movement to articulate the human condition and spirit through the unbounded art form of dance. Working against stereotypes and misconceptions of African-American culture, the concept of Ballet Afrique was born in 2008 to offer East Austin youth an opportunity to experience the richness of their own culture through the arts alongside other beautiful cultures represented in Austin. Please join us for this very special show. If you go to no other show this year, come to this one and make a memory of a lifetime for some very special children. Blue Lapis Light presents Youth Taking Flight to Neverland, an aerial dance inspired by the story of Peter Pan, a boy who never grows up and flies into endless adventures. This is a whimsical and heart-warming version of Peter Pan’s tale told by our Youth Taking Flight students. Youth Taking Flight is an aerial dance program where students collaboratively create original performances using aerial silks and story-telling through dance. This semester we tell the story of Peter Pan’s encounters with mermaids, pirates, parents and much more. We hope you join us at the One World Theatre (7701 Bee Cave Rd) for this special event!